If the road to Keswick is still closed, we will instead walk at Tarn Hows. When we went to Monk Coniston in 2010 we did a similar walk. We will depart after breakfast at about 0900 and drive to a pay and display car park on the shore of Coniston Water. We hope to be walking by 0930. We will start walking when everyone has arrived. The walk starts by ascending through the grounds of Monk Coniston, but it is never difficult. When we reach Tarn Hows, there is a toilet. We then walk round the whole of the tarn, and finally descend by a different route. The walk is a little over 5 miles, but can be slightly shortened by coming down by road. 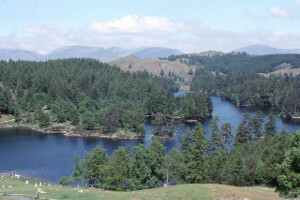 Anyone who does not want the full walk can omit the circuit of Tarn Hows. Click for a map of the walk. The nearest is a cafés are in Coniston, where you will have to pay to park. You could return to the café at Skelwith Bridge, where parking is free. Alternatively, you will probably be able to find somewhere to eat wherever you decide to spend the afternoon.